How did the observations of Pierre Bayle, Thomas Hobbes, early Quakers, Isaac La Peyrere, and the discovery of other races of people in the Americas affect thought about the authority of the Church and the authority of the Bible? With the advancement of reason and critical thinking people began to challenge basic assumptions including those about religion and God. Pierre Bayle challenged the assumption that Christian ethics were a necessary product of Christian doctrine, like for instance the Church’s stance on slavery being an excellent example. He argued that Atheists could have a civil and moral society without the need for a divine Father figure. In many cases the Church’s stance on moral issues instead of being universal was based on local customs and fads as any other faith. Other than being an anti-trinitarian, Thomas Hobbes challenged conventional assumptions hinting in his writings that no Christian doctrine should be taken only on trust. It was also becoming painfully obvious that different Bibles had numerous variations which cast doubt on its complete infallibility. Quakers also lent to this movement since they did not believe the Bible as the ultimate authority, but the light of the Spirit in themselves. Catholics themselves hold the Pope higher than the Bible. Even the Bible itself was used as an argument, on how it was decided to be put together. Questions were raised as to why some equally important letters and texts existing at the same time of the New Testament were included and some were not. For instance, a correspondence with Jesus and King Abgar of Edessa was not important enough to be included in the Bible, but a letter from Paul to Philemon was? The discovery of other races of people in America gave serious thought about whether all men were descended from Adam. The native Americans were so different that people wondered if they were the same species. If they weren’t descended from Adam, it would be a blow to the doctrine of universal Sin. People fear that as scientific knowledge grows, it diminishes God. It’s not that God changes as knowledge grows, but our understanding of the nature of God changes. The Lords of the ma’amad, having long known of the evil opinions and acts of Baruch de Espinoza, have endeavored by various means and promises, to turn him from his evil ways. But having failed to make him mend his wicked ways, and, on the contrary, daily receiving more and more serious information about the abominable heresies which he practiced and taught and about his monstrous deeds, and having for this numerous trustworthy witnesses who have deposed and born witness to this effect in the presence of the said Espinoza, they became convinced of the truth of the matter; and after all of this has been investigated in the presence of the honorable chachamin, they have decided, with their consent, that the said Espinoza should be excommunicated and expelled from the people of Israel. By the decree of the angels, and by the command of the holy men, we excommunicate, expel, curse and damn Baruch de Espinoza, with the consent of God, Blessed be He, and with the consent of all the Holy Congregation, in front of these holy Scrolls with the 1613 precepts, which are written therein, with the excommunication with which Joshua banned Jericho, with the curse with which Elisha cursed the boys, and with all the curses which are written in the Book of the Law. Cursed be he by day and cursed be he by night; cursed be he when he lies down, and cursed be he when he rises up; cursed be he when he goes out, and cursed be he when he comes in. The Lord will not spare him; the anger and wrath of the Lord will rage against this man, and bring upon him all the curses which are written in this book, and the Lord will blot out his name from under heaven, and the Lord will separate him to his injury from all the tribes of Israel with all the curses of the covenant, which are written in the Book of the Law. But you who cleave unto the Lord God are all alive this day. We order that no one should communicate with him orally or in writing, or show him any favor, or stay with him under the same roof, or within four ells of him, or read anything composed or written by him. What did Spinoza do to elicit such harsh indictment against him by his own Jewish community? In a nutshell, Spinoza simply put into writing his radical ideas and theological views that denied the existence of an immortal soul, rejected the notion of a providential God, and that the Law was neither literally given by God nor had any legal binding on Jews. Spinoza himself had already taken the initiative to separate himself from the Talmud Torah congregation and was vocally expressing his hostility to Judaism itself. He had probably stopped attending services at the synagogue either after the lawsuit with his sister or after the knife attack on its steps. He might already have been voicing the view expressed later, in his Theological-Political Treatise, that the civil authorities should suppress Judaism as harmful to the Jews themselves. Either for financial or other reasons, he had in any case effectively stopped contributing to the synagogue by March 1656. He had also committed the “monstrous deed,” contrary to the regulations of the synagogue and the views of certain rabbinical authorities, of filing suit in a civil court rather than with the synagogue authorities —to renounce his father’s heritage, no less. Thus there can be no mystery to his sanction by the Orthodox Jewish community in Amsterdam. Spinoza argued that God exists and is abstract and impersonal. Spinoza’s system imparted order and unity to the tradition of radical thought, offering powerful weapons for prevailing against “received authority.” As a youth he first subscribed to Descarte’s dualistic belief that body and mind are two separate substances, but later changed his view and asserted that they were not separate, being a single entity. He contended that everything that exists in Nature is one Reality and there is only one set of rules governing the whole of the reality which surrounds us and of which we are part. Spinoza viewed God and Nature as two names for the same reality, namely a single, fundamental substance that is the basis of the universe and of which all lesser “entities” are actually modes or modifications, that all things are determined by Nature to exist and cause effects, and that the complex chain of cause and effect is understood only in part. His identification of God with nature was more fully explained in his posthumously published Ethics. Spinoza’s main contention with Cartesian mind–body dualism was that, if mind and body were truly distinct, then it is not clear how they can coordinate in any manner. That humans presume themselves to have free will, he argues, is a result of their awareness of appetites which affect their minds while being unable to understand the reasons why they want and act as they do. 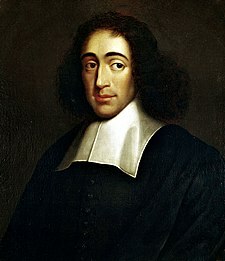 Spinoza has been described by one writer as an “Epicurean materialist,” although to call Spinoza a materialist (as the Epicureans were) would be misleading as he treats both thought and extension (physical reality) as derivatives of an ultimate, infinite substance which expresses infinite attributes and modes. To use an example, human experience is but a single drop of water in an infinite ocean, which constitutes existence. Spinoza contends that “God or Nature” is a being of infinitely many attributes, of which thought and extension are two. His account of the nature of reality, then, seems to treat the physical and mental worlds as intertwined, causally related, and deriving from the same substance. He directly contests dualism. The universal substance emanates both body and mind; while they are different modes, there is no fundamental difference between these aspects. This formulation is a historically significant solution to the mindy-body problem known as neutral monism. Spinoza’s system also envisages a God that does not rule over the universe by Providence in which God can make changes, but a God which itself is the deterministic system of which everything in nature is a part. While it could be said that this still accounts for Divine Providence, as Spinoza argues that “things could not have been produced by God in any other way or in any other order than is the case,” he directly challenges a transcendental God which actively responds to events in the universe. Everything that has and will happen is a part of a long chain of cause and effect which, at a metaphysical level, humans are unable to change. No amount of prayer or ritual will sway God. Only knowledge of God, or the existence which humans inhabit, allows them to best respond to the world around them. Thus, according to this understanding of Spinoza’s system, the universe humans currently live in and experience comes from God. God is completely impersonal to existence because, not only is it impossible for two infinite substances to exist, God—being the ultimate substance—cannot be affected by anything else, or else it would be affected by something else, and not be the fundamental substance. Spinoza’s philosophy has much in common with Stoicism inasmuch as both philosophies sought to fulfill a therapeutic role by instructing people how to attain happiness. However, Spinoza differed sharply from the Stoics in one important respect: he utterly rejected their contention that reason could defeat emotion. On the contrary, he contended, an emotion can only be displaced or overcome by a stronger emotion. For him, the crucial distinction was between active and passive emotions, the former being those that are rationally understood and the latter those that are not. He also held that knowledge of true causes of passive emotion can transform it to an active emotion, thus anticipating one of the key ideas of Sigmund Freud’s psychoanalysis. According to Spinoza, reality is perfection. If circumstances are seen as unfortunate it is only because of our inadequate conception of reality. While components of the chain of cause and effect are not beyond the understanding of human reason, human grasp of the infinitely complex whole is limited because of the limits of science to empirically take account of the whole sequence. Spinoza also asserted that sense perception, though practical and useful for rhetoric, is inadequate for discovering universal truth; Spinoza’s mathematical and logical approach to metaphysics, and therefore ethics, concluded that emotion is formed from inadequate understanding. His concept of “conatus” states that human beings’ natural inclination is to strive toward preserving an essential being and an assertion that virtue/human power is defined by success in this preservation of being by the guidance of reason as one’s central ethical doctrine. According to Spinoza, the highest virtue is the intellectual love or knowledge of God/Nature/Universe. Encapsulated at the start in his Treatise on the Improvement of the Understanding (Tractatus de intellectus emendatione) is the core of Spinoza’s ethical philosophy, what he held to be the true and final good. Spinoza held good and evil to be relative concepts, claiming that nothing is intrinsically good or bad except relative to a particularity. Things that had classically been seen as good or evil, Spinoza argued, were simply good or bad for humans. Spinoza believes in a deterministic universe in which “All things in nature proceed from certain [definite] necessity and with the utmost perfection.” Nothing happens by chance in Spinoza’s world, and nothing is contingent. Describe the impact the 1492 expulsion of the Jewish population in the Iberian peninsula had upon Europe as they spread to other territories. How did they view the Reformation? How did the culture of doubt and skepticism of religion come about as a result of oppressive Church practices like the Iberian Inquisitions? How did the religiously tolerant atmosphere of places like Amsterdam foster religious skepticism? One major upshot of the severe practices of Iberian Inquisitions had upon Europeans, as they forced persons to convert, was to “breed skepticism about all religious patterns.” (loc. 15059) The Netherlands had been a region of great religious strife during the Reformation as Catholics and Protestants persecuted one another. During the 16th century, many Dutch persons became weary of all strident forms of religion. Many remembered great Dutch dissenters like Erasmus and Jacobus Arminius who were expelled from or severely frowned upon by the Church for their thoughts. This did much to alienate dissenters and forced them to decide about their religious affiliations outside the mainstream. Some opted to form their own form of rational religion that dispensed with the need for clergy. After reading this section of the chapter, it was surprising to learn that the actions of the Catholic Church and the conflicts of the Reformation would plant the seeds of religious skepticism and doubt that the Enlightenment would further foster in later years. However, at the same time it is not surprising at all. I’m sure many would question the validity of God, the Church, and other religious practices as people witnessed the violence, suffering, and persecutions caused by the Inquisitions, Catholic and Protestant clashes, and other Christian-on-Christian violence inflicted upon them and others- so this is no surprise at all that persons would gravitate away from religious authority or from religion all together. MacCulloch opened up the second section of the chapter by describing how doubt is fundamental to religion; for instance, there are many instances in the Bible where people struggled with doubt. During the time before and after the Reformation and Counter-Reformation, expressions of doubt were suppressed at the cost and expense of one’s life. However, doubt and skepticism would slowly take the forefront as religious dissenters would gather together and meld their doubts into a systematic front during the 17th century. How tragic (or ironic) that the Church’s misplaced fervor and continued anti-Semitism and End Times beliefs that Jews must convert (or be forced to convert) to bring about the Second Coming (a belief that still holds strong to many Christians today), and other religious conflicts were to lay the groundwork of the modern Western culture’s continued skepticism of God, religious institutions and doubting of claims to religious truth. As Paul wrote in Galatians 6:7, “whatever one sows, that will he also reap.” These events should caution believers today that his or her actions and beliefs can and will have major (unforeseen) repercussions for future generations for the good or bad of the Church (whereby I mean “the body of Christ”) as a whole; all churches should better strive to be wiser and better informed witnesses and ambassadors for Christ bearing this invaluable knowledge of history and its consequences in mind.